Starting last year, we have been working on the Microsemi VSC7513 and VSC7514 MIPS processors. They have a 500 MHz MIPS 24KEc CPU and the usual DDR, UART, I2C and SPI controllers. But more interestingly, they also have an 8 or 10-port Gigabit Ethernet switch allowing to offload common network bridging operations to the hardware. As is usual for that kind of products, the vendor-provided SDK (called WebStaX) used to configure the switch is running in userspace and uses a custom in-kernel UIO driver to talk to the hardware. The initial support for the switch was merged in v4.18. 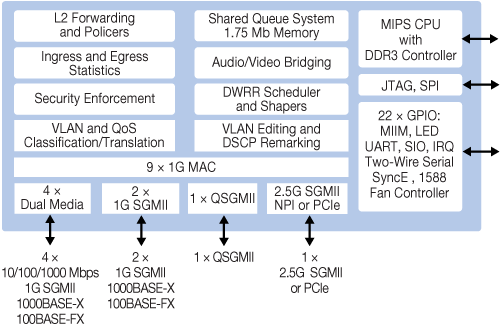 It supported bridging, STP and IGMP snooping support but also a driver for the MDIO interface. Finally, VLAN filtering and link aggregation support will appear in the upcoming v4.19. The whole driver based on the switchdev Linux kernel subsystem, is about 5700 lines long. Here, the driver configures the VIDs on each port and what to do about them (tag, untag, forward). The driver has to configure the aggregated ports and the balancing mode. It also has to ensure the switch will forward the control frame (LACPDUs) to the CPU so Linux can know the state of the links. IGMP snooping is a simple feature where the switch is able to push new multicast addresses to the CPU so Linux can install the MACs in the table and avoid having to forward the multicast frames on all the switch ports. In our case, it is simply enabled using a single register when multicasting is enabled on the bridge. The switch supports more features to be worked on: PTP timestamping, QoS and packet filtering to name a few. We have already implemented PTP support, and we will be submitting upstream this additional feature in the near future. If you’re interested about upstream Linux kernel support for other Ethernet switches, do not hesitate to contact us!